Sept. 5, 2018 -- All the way back in 1963, China sent 100 healthcare workers to Algeria after it gained independence from France – and coordination between the sides hasn't looked back. China has deployed doctors to help take on epidemics, and training programs help both sides learn from one another. Chinese cardiologist Wang Weimin recently completed his last day of routine work in Africa – performing check-ups and other procedures on patients after over a year at the Levy Mwanawasa hospital in Zambia. Wang, one of the 20,000 Chinese medical workers to have journeyed to Africa to share knowledge and expertise, stressed the importance of training programs for African medical students in China. "Since China's reform and opening up, a large number of African students have studied medicine in China. Their studies in China deepened their understanding of China, and established strong ties." Zambians that worked with the Chinese team were saddened by their imminent departure. "They are leaving. I feel so bad. Zambia will lose out a lot because they were really helping us out. So I'm feeling bad, and I'm hoping when they go back, they have a safe life, and [they will] come back here, so that they can continue helping us here," said Kabonde Naomi, a Zambian doctor. Since 1963, China has sent over 20,000 medical workers to Africa and helped accelerate medical progress there, including building medical institutions, providing medicines and medical devices, organizing training sessions, and offering scholarships for medical students. 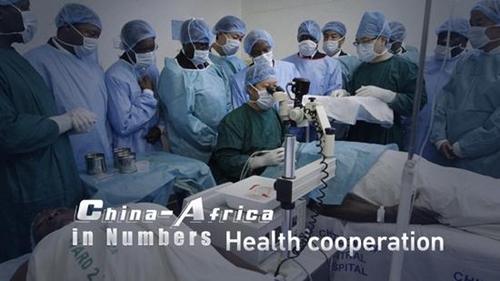 At the 2006 Forum on China-Africa Cooperation (FOCAC), officials introduced measures to broaden bilateral cooperation in areas such as medical care and public health. The FOCAC summit held in Johannesburg in 2015 listed public health cooperation as part of the 10 China-Africa cooperation plans, in which China pledged to work with all other countries, international organizations and non-governmental organizations in addressing the global health challenge, and through South-South cooperation, to help build the health sector in developing countries.